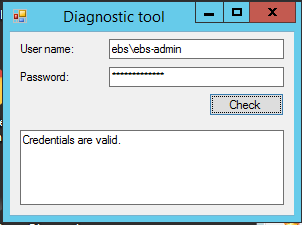 This Instruction Article explains how to troubleshoot Active Directory authentication using Diagnostic Tool utility. 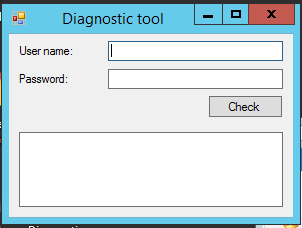 This utility was created as a tool to assist in troubleshooting login problem with Active Directory credentials (only). Download the software and extract the zip file. The extracted folder should contain 2 files; DiagnosticTool.exe and DiagnosticTool.exe.config. The result will appear on the space below the Check button. 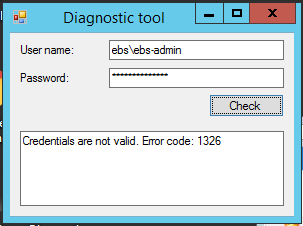 If there are no errors, you will see Credentials are valid message. Receiving the Credential are not valid message does not mean that the authentication fails. For example, if you get the Credential are not valid message with Error code: 1385, it means “The user has not been granted the requested logon type at this computer”. If you are trying to verify the validity of the password, the test confirmed that the password is good but the user does not have the rights to login to the system. Be careful and be aware of what you are testing for so you can interpret the result correctly.